Once I knew I was moving to London I put myself on a spending ban, the tempation to shop was strong but the idea of having even more to pack kept me away from the shops. Now that I've settled in a bit more and with birthday discounts appearing in my inbox, I'm eyeing up some pretty things. With having just moved my main interest is decor and storage, I've been browsing through IKEA wanting all the things, but telling myself to wait until we're settled in more before making any big purchases. I'm a bit late to the sneaker trend, but with the amount of walking I've been doing lately I've been wanting a pair of Nike Roshe runners. The black seem to be hugely popular, especially amoung fashion bloggers but I'm quite drawn to the grey pair. Grey seems to be this months favourite colour! I've spotted them in a local designer outlet on discount so they may just be my birthday gift to myself! I've picked up a lot of army green items lately too, and loved seeing how people have been styling the khaki bomber jackets, think it's a must have this spring! 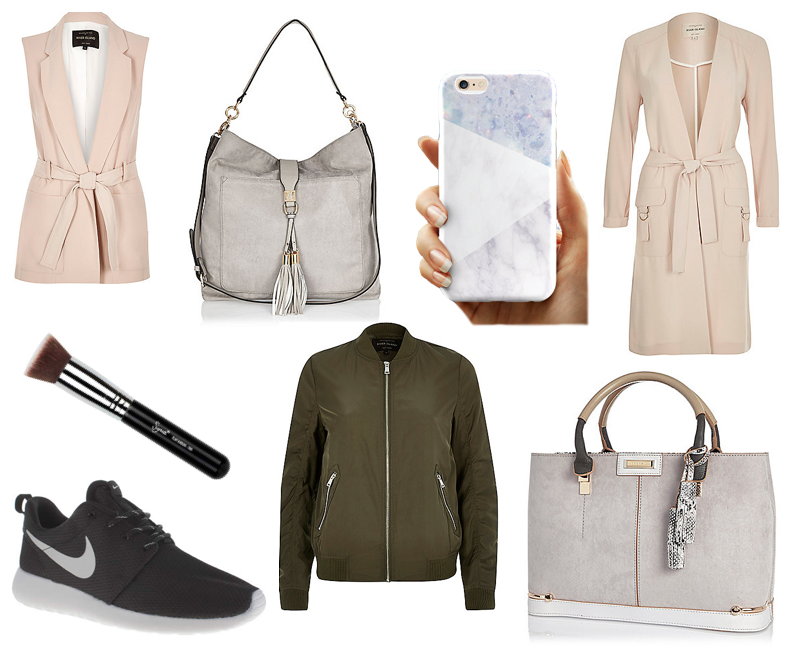 I also seem to be drawn to blush coloured items which isn't like me at all, but how gorgeous is this sleeveless jacket and this duster coat, very Olivia Pope! I am obsessed with River Island bags, it's a weakness and while I usually go for slouchy bags like this gorgeous grey one I've also been drawn to more structured bags - both in grey, obviously. My favourite foundation brush by Sigma completly fell apart this weekend, it doesn't travel well it seems. I also need a new phone case as mine has started cracking, I love the marble-esque ones from RockSteadyCases, they have a gorgeous selection! What have you had your eye on this month? Anything I'm missing out on?